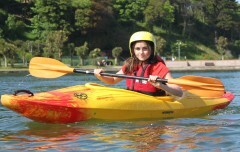 Our Inland introductory kayak session take place on the sheltered water of the Mooragh Park Lake in Ramsey. We have a selection of single seater closed cockpit kayaks and double and single sit on top kayaks to suit your group. All sessions will include safety briefing and sessions will be run appropriate to the ability and previous experience of the group. All staff hold BCU Qualifications. We use a range of kayaks including master TG lites, Pyranha G8s and Robson Moonsters. Depending upon the weather we may issue wetsuits. It is a good idea to bring shorts or swimming costume and long sleeve thermal base layer or T shirt to wear under wet suit.